Born at Darlington, Ontario on 27 April 1839, Kennedy was educated at Peterborough, work for a time as a contractor, then began law studies. He came to Manitoba with the Red River Expedition under Colonel Wolseley, after which he remained at the Settlement as Registrar of Deeds. He was the second Mayor of Winnipeg, and a member of the first North-West Council. He was president of the P. & W.R.R., the S.W.C.R.R., the North-West Fire Insurance Company, and the Winnipeg Philharmonic Society; a member of the Orange Lodge, and Grand Master for the Grand Lodge of Manitoba. Kennedy commanded the Winnipeg Field Battery and the 90th “Winnipeg” Battalion of Rifles. 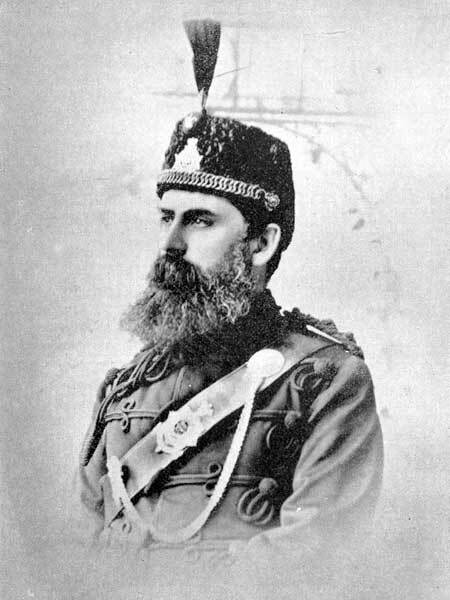 He took a hundred voyageurs to serve with the British Army in the Nile expedition 1884-1885, and was appointed Paymaster of the Canadian Voyageur Contingent. He was married to Mary Ann Kennedy, with whom he had five children, including son Charles William Nassau Kennedy. He died of smallpox in London on 3 May 1885, en route home from the Sudan. He was buried in Highgate Cemetery with full military honours. He is commemorated by Kennedy Street in Winnipeg. Records of the Nile Voyageurs, 1884-1885 edited by C. P. Stacey(1959). Canadians on the Nile, 1882-1898 by Roy MacLaren (1978). William Nassau Kennedy, Dictionary of Canadian Biography XI, 471-73. William Nassau Kennedy by Keith Wilson, Canadian Biographical Series, 1989.